We are still in the second month of February and a lot of new products were already announced. 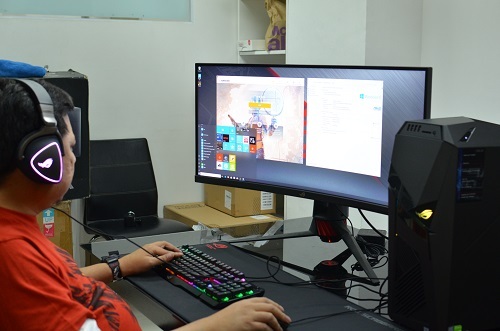 Last month, the announcement of new NVIDIA Graphic Cards opened the gates to new ROG products like the refreshed ROG Strix Hero II and SCAR II and the much anticipated ROG Mothership. Those were just the start. Today, we present to you another new but existing product in the Republic of Gamers – the ROG Strix GL12CX. New, but not really. 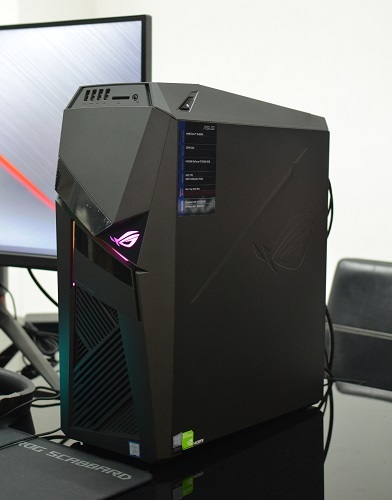 Actually, the ROG Strix GL12CX is a refreshed version of the ROG Strix GL12. I’m currently reviewing the GL12 as of the moment so it was a perfect moment for me to check out the GL12CX. Thing is, nothing has really changed in the chassis. 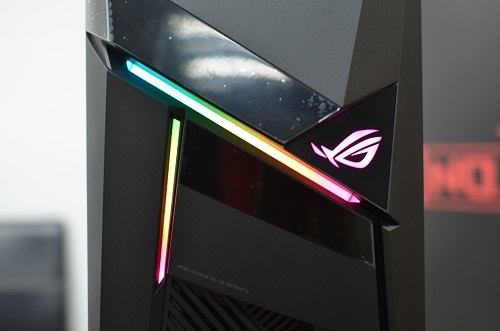 Nevertheless, let me walk you through the exterior of the ROG Strix GL12CX. 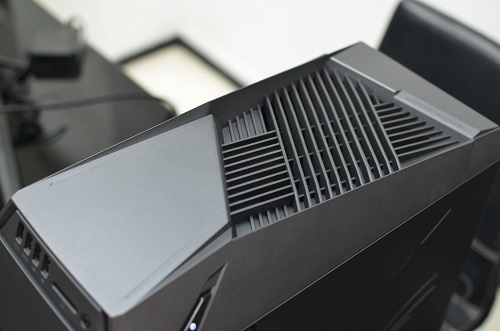 I reviewed the ROG Huracan G21 last December and I was so used to its mid-Tower size. It was easier to move the PC between my house and the studio thanks to its size and weight. The ROG Strix GL12CX on the other hand is a Full Tower sized PC that not only looks intimidating, it’s also on the heavier side. The chassis is composed mostly of black metal chassis. In the ASUS website, the GL12CX has a dark glass on its side cover. 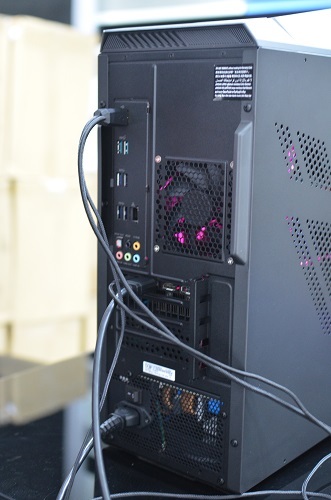 The glass is not attached to the PC as you can see in the picture, but we’re certain it will be included in the package. Also, if you want the PC to be a bit more discreet, than you can change the side to a metal cover. 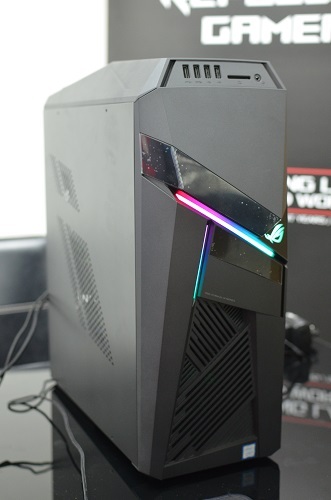 The Ninja-inspired GL12CX has two RGB strobe lights and a ROG logo, also with RGB. It looks menacing, and I like it! 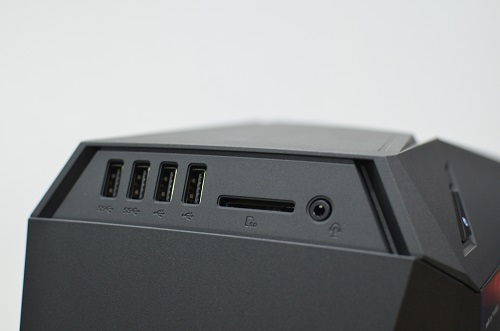 There are two USB 3.1 and two USB 2.0 ports, a SD Card slot and a 3.5mm headphone jack on the top section of the tower. This is certainly useful for people who insert flash drives and hard drives on the go without having the trouble on looking for ports on the back of the PC. The SD Card slot is something I need up to now so I can transfer photos from my DSLR Camera. Removing the magnetic cover on the upper section of the GL12CX reveals a DVD drive and a 2.5-inch drive bay which is hot-swappable. There are vents on the top and lower front section of the PC. I thought at first they were just designs of the case. 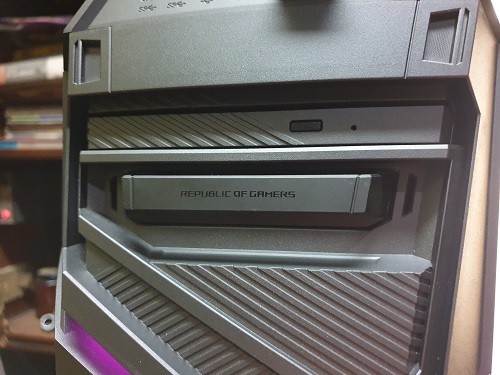 The back portion of the ROG Strix GL12CX have plenty of ports. There are two USB 2.0, two USB 3.1 Gen 2, four USB 3.1 Gen 1, five audio jacks, one Optical S/PDIF Out, and an RJ 45. It also has two display ports, two HDMI ports and one DVI so this means it supports multiple gaming monitors for your needs. 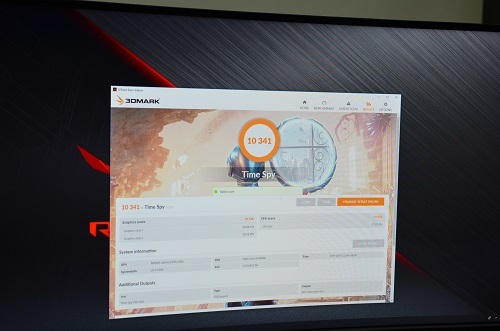 The ROG Strix GL12CX now has a more powerful Intel 8th Gen Core i9-9900K. Also upgraded in this refresh is the GPU, which is now a GeForce RTX 2080. Yes, we have one very powerful gaming PC right here my friends! Unfortunately, due to our limited time and slow internet connection in their office, we were only able to do one benchmark test on the GL12CX. Time Spy gave it a score of 10,341 which is miles higher than the score we got on the original GL12CX with GTX 1080. That’s a very good sign, for now. 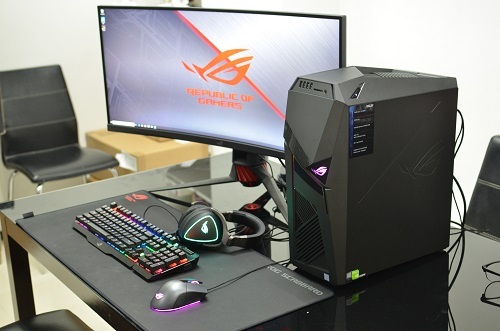 That’s it for our first impressions, but the good news is we’ll be reviewing the ROG Strix GL12CX in our home office for a longer period of time. While you guys wait for that, we’ll be coming up with our reviews of the ROG Huracan G21, TUF Gaming FX10 and the ROG GL12 with GTX 1080.